According to Lineage, the nightlies are based on the October monthly updates from Google. 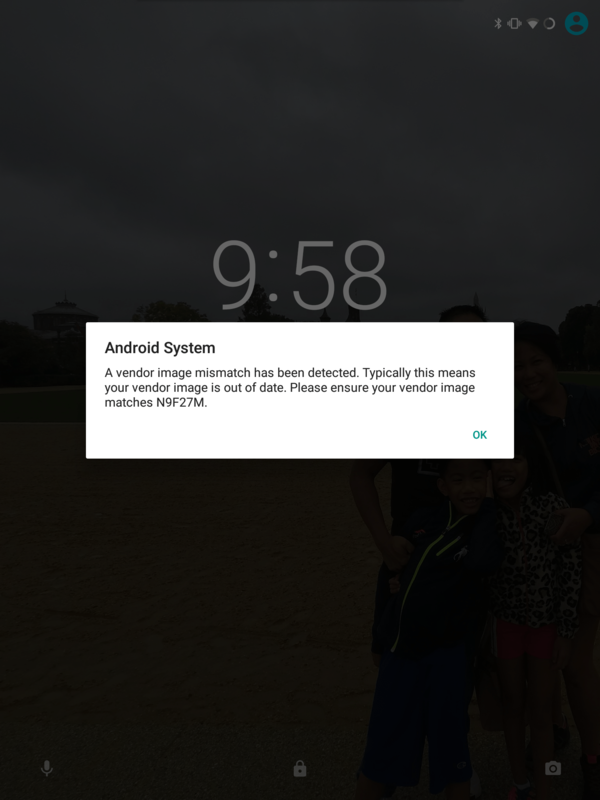 Which means the vendor image needs to be extracted from the factory image from Google and updated on the Nexus 9. Once the vendor img has been extracted or downloaded, you’ll need to use adb fastboot to install it. ​So I preordered the Google Pixel XL the day of the announcement on October 4th,and the phone came in today. Haven’t really played around with it too much as I’ve been loading apps that I want to I use. I could’ve just installed all off the automatically but I’ve been wanting to clean up my phone for a bit and this gave me a good opportunity to. So far the phone feels solid, almost iPhone like. In fact it does look like it from the front without button. Feels quick and snappy. The Android 7 (Nougat) OS is very clean with lots of round icons. I’ll post again in a few days after putting it through its paces… If I remember. According to various blogs, articles, etc the devices was probably rooted with a non factory image. This may be possible as I bought a refurbished one from Best Buy. The only way to fix was to flash with the factory image. So i figured, why not flash to Android 6.0 (Marshmallow). After much googling, I was able to download what I need and flash. The process was fairly simple. I will list out the steps that I used here. There lots of resources online on how to do this, but I figure I can put together what worked for me here. You’ll probably want to install it somewhere you can easily get to like c:android but that is up to you. The adb tool will be found in <install dir>/platform-tools. You’ll also probably want to put <install dir/platform-tools> in your PATH to make things a bit easier as well. Otherwise you will need to specify the direct path to adb along with the direct path to the system image to be flash. before delving into the flashing, you’ll want to check to see if your device can be seen. run adb device to see if it is connected. If it is, you’re pretty much golden. If not, you’ll need to go into Developer Mode, enable USB Debugging and Enable OEM unlock. To get into developer mode, go to settings –> About Tablet, and tap on Build Number 7 times. flashing will take a few minutes. I would recommend not to disconnect your device from your computer. You’ll know its done when the command prompt says Press Any Key to exit and your screen is at the setup screen.